Forest of Bliss is intended as an unsparing but ultimately redeeming account of the inevitable griefs and frequent happinesses that punctuate daily life in Benares, one of the world’s most holy cities. The film unfolds from one sunrise to the next without commentary, subtitles or dialogue. Three central figures are a healer of great geniality who attends the pained and troubled, a baleful and untouchable King of the Great Cremation Ground who sells the sacred fire, and an unusually conscientious priest who keeps a small shrine on the banks of the Ganges. Poet Seamus Heaney wrote of the “deep and literate gaze” Robert Gardner transmits “with an intensity that passes from the documentary into the visionary” in his film Forest of Bliss. A decade and a half after its making, it is recognized as a contemporary classic of nonfiction cinema. Making Forest of Bliss, the first in Harvard Film Archive’s series “Voices and Visions in Film,” presents a dialogue between Gardner and his colleague anthropologist Akos Ostor, illustrated with more than 150 images captured from the film. 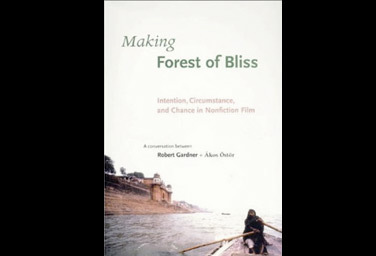 Recalling the conditions of its filming in Benares, India, in 1985, and presenting their moment-by-moment impressions upon watching it several years later, Gardner and Ostor probe questions of what it means to capture life and death on film and ponder how the filmmaker’s intentions, choices necessitated by circumstance, and the serendipity of chance contribute to this endeavor. The resulting conversation is a lively exploration of issues philosophical, anthropological, and–above all–artistic. The volume contains an introduction by philosopher Stanley Cavell and includes a newly mastered DVD of the complete film.